The pancreas in birds is situated in the dorsal mesentery between the descending arm (pars descendens) and ascending arm (pars ascendens) of the duodenal loop. 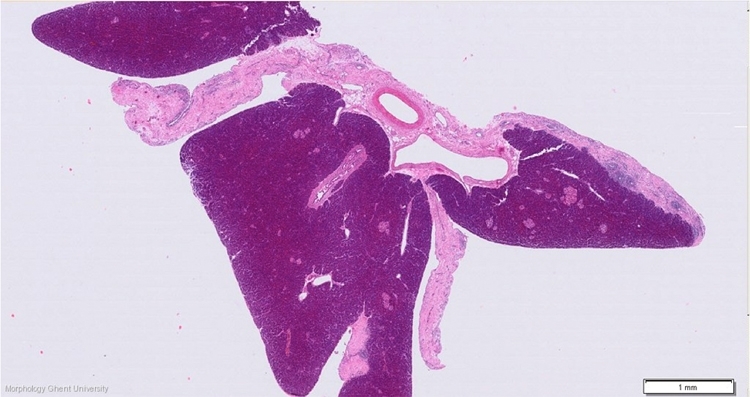 It is a long, narrow gland which is composed of three lobes, a dorsal lobe (lobus pancreatis dorsalis), a ventral lobe (lobus pancreatis ventralis) and a splenic lobe (lobus pancreatis tertius). The pancreas consists of an exocrine and an endocrine compount.